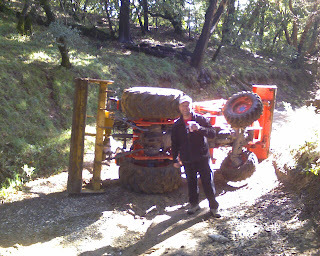 Did I tell you how my neighbor tipped his tractor over? He loves driving this tractor around, moving parts of the road from one place to the other. One morning he called me with a small problem. He had driven up the side embankment, and tipped over. I first tried to pull it upright with my truck, but because I was going uphill on wet ground, and with the angle of the tires, I couldn't get it. 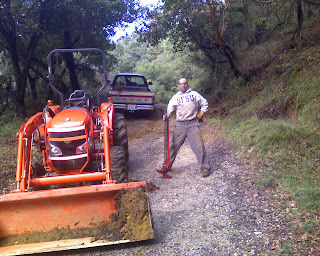 Then I went home and got my farm jack, and using a good spot on the (top) side, I easily tipped it back over. I really should just carry that jack around with me all the time. So, here's a little video of my firewood piles and axe yard, with me speaking through the tour. The sound is horrible, and Melissa moves the camera (my phone) around too much, so it's easy to get dizzy. Still, that's a lot of firewood! Finally got the new pulley for the alternator, and figured out how to use the bolts on the bushing to push the bushing (the center thing) out of the old one. Then, using my special broken screwdriver, I wedged open the bushing again to get it back on the shaft, and afixed the new, smaller pulley. Next step is experimenting with the small pulley to see if I can get a smooth enough current out of the thing with the engine at a slower speed to run my battery charger. Meanwhile, Melissa has attacked the 'cold box in the kitchen floor' (we really need a better name for that) tiling job. We got these brown tiles due to eagle eyes of the sister-in-law, and they already had those corners cut off, so Melissa found some slate and made some accent pieces for them. this box is deep enough for a 5 gal (20 ltr) bucket. Melissa continues to work on the window sills, adding sealer to the grout. and, a week or two ago, I got the loft floor up, planed smooth and screwed down. I have yet to decide how I'm going to treat that wood... probably will oil it, not varnish. Here's a shot from underneath. We're debating about cutting a curve in this edge, but that would create a challenge for the future banister/railing. They now cover the whole front window sill. Some servas folks come to cob! Here in the depth of rainy winter, we had some visitors via servas (www.servas.org), which we've been in since 2003. They wanted to cob, so we put them to work. We all quickly danced out two batches, with help from their 3 year old. The coolest thing was, they are driving around the Americas in a VW bus, which they decked out with many cool cubbie holes and smart storage. AND, it got all the way up to our place with only a little towing. We had a few days this week where it didn't rain, and we managed to talk the sand delivery people into coming up again. 20 more tons of sand, right outside the front door.